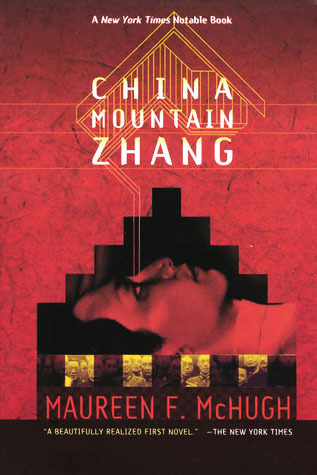 I read China Mountain Zhang because of Jo Walton's What Makes This Book So Great - a book of recommendations for SF novels. Jo Walton's thoughts about China Mountain Zhang intrigued me. As a matter of fact, her review is so insightful and clear, I agree with her comments almost entirely. So I'll cheat a little in my own reviewing: please go and read Jo Walton's review first. Right. Now that you know the gist of it, I can point out the things I felt a bit differently about. For one, I didn't quite get that "collection of short stories" feeling from this mosaic novel. I don't read many mosaic novels. Off the top of my head, the one mosaic book that I recall reading is Behind The Beautiful Forevers - and that is a work of non-fiction. So it's not a style I am very familiar with. To me, China Mountain Zhang did not feel like a novel, nor like a collection of short stories, nor even a combination of the two. Instead, it felt like I was reading chapters from completely different novels (set in the same world) that had somehow been put into one book. Each chapter threw me into an ongoing storyline, each chapter ended without conclusively ending a storyline. The first section did feel like the most substantial thing - like a novella, I guess, or like Act One of a Three Act Play. But after that, no chapter, no plotline develops in traditional story arcs. One chapter might fit into Act Two of another novel (which just happens to have a slight overlap with this one), while another might come from Act Three of a different novel entirely. A perfect example would be the chapter written from the viewpoint of a kiteracer: by this point, we have been in kiteracing audiences in other chapters. We have even encountered kiteracers in passing. But where she comes from - and what happens to her after her chapter is done - is left entirely open. We get a chapter that feels like it belongs in a novel about kiteracers, one chapter only, no more, no less, and it's a middle chapter, not a beginning and not an end. Jo's review is absolutely right in saying that this novel keeps you reading on, even though no one goes on any quests, no one gets to have big adventures, and everyone has to get by and work and muddle through. (My paraphrasing). As someone who likes his book a little more swashbuckling and escapist, the understated drama of the book left me expecting some big developments - I constantly expected some big revelation around every corner. Instead, the book stayed very down-to-Earth in its dramatic developments (even though some of it takes place on Mars). Yes, characters make life-altering decisions, but it's mainly their own lives they affect, and the lives of those closest to them. No one affects the world. No one is more than a little cog in a giant machine. It's clearly an intelligent book, and it has high literary merit. Every character and every development is entirely believable - including the future society of near-global Chinese Socialism. That said, the book was a little too literary for my tastes. It turns out that understated, small dramas about small people are probably the things I want to escape from, just as much as the mundane world of working in an office in the 21st century. China Mountain Zhang is an impressive work, but one of its achievements is to put the exact kind of literature that I am least interested in, into a science fictional world (i.e. a genre that piques my interests). So I cannot really love this book.